Rafale means ‘gust of wind’ in French, and this Meriden-era triple is all about lightness and speed. It’s also a showcase for Amann’s amazing coachworking skills, with raw metal bodywork and an impeccable stance. Although he now practises out of a workshop in the south of England, Amann was trained in France. He has a background in automotive engineering and design, and is enthused by all things handmade. He started the company four years ago, and focuses on fabricating and restoring classic cars and bikes. 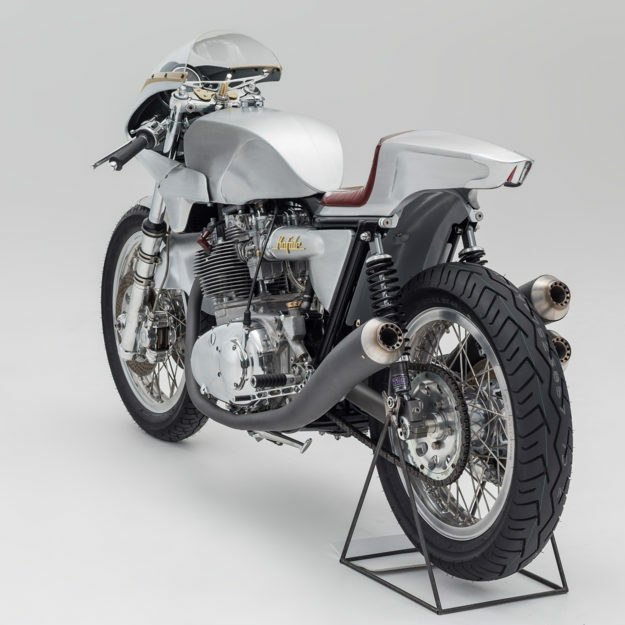 Amann has a soft spot for the classic Triumph triples from the late 1960s and 1970s. 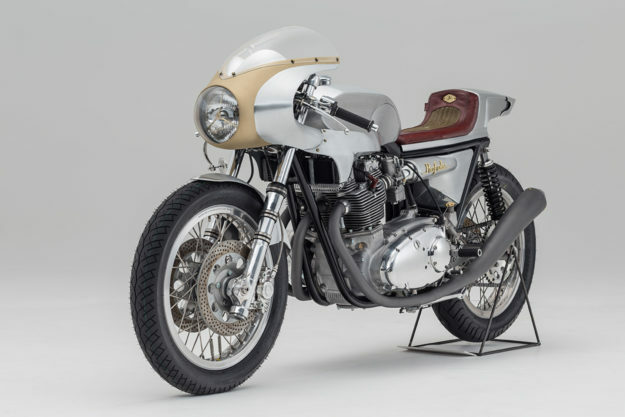 “Originally, the bike was a standard Triumph Trident,” he tells us, “but we swapped the chassis for a stronger T140 Bonneville frame, with the oil running through the central spine.” Since an external oil tank was no longer required, the oil-in-frame setup allowed more design freedom. The Triumph T140 frame has a good reputation, but its Achilles Heel has always been the swingarm—which was under-engineered for the twin engine, let alone for the big 750cc triple. 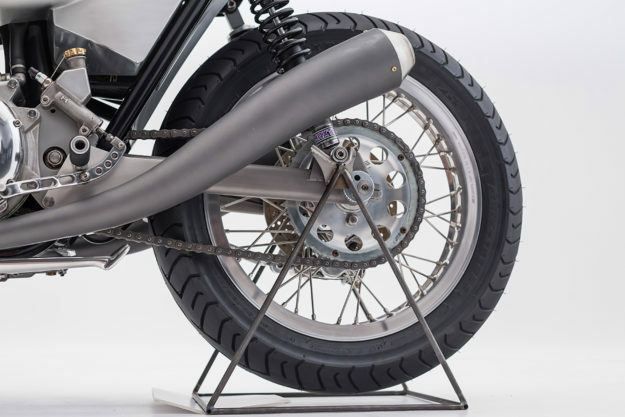 So Amann has designed and fabricated a new swingarm using T45 high-strength, aircraft grade steel tube, shaped for a strong and elegant oval profile that complements the classic look of the Triumph. 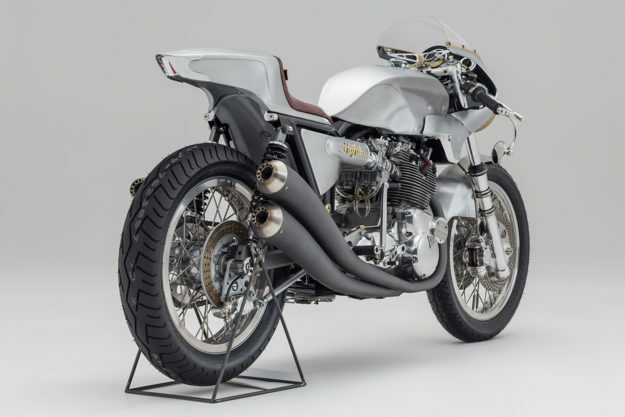 The English suspension specialists Maxton took care of the rear shocks, but the front end is a period-correct upgrade—Amann has fitted a hard-to-find pair of 38mm Marzocchi forks with a leading axle, as fitted on the early Ducati bevel drive 750 GT and S from the 1970s. 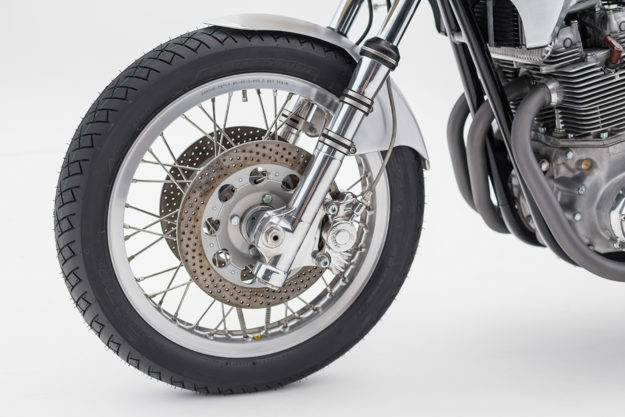 The front brake disc rotors are also of Italian provenance, installed using custom aluminum disc carriers designed and machined in-house to fit the original Triumph front hub. The braking system is British thoughout, with a full AP Lockheed front and rear setup, known for its remarkable performance in classic racing. Our favorite part is the 3-into-3 exhaust system, a homage to 1960s GP racing. The double curvature megaphones are entirely handmade, and ceramic coated in grey by Simon Crack of Flying Tiger Coatings. They match the brushed aluminum bodywork beautifully. The stuff we can’t see has been taken care of as well. 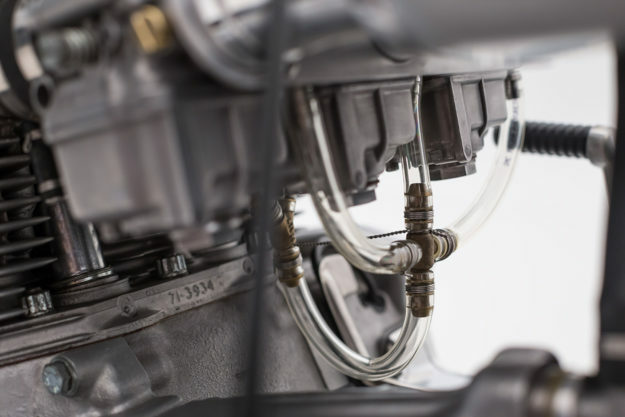 The air-cooled engine was completely rebuilt: “All the internal components were reconditioned, modified or replaced to make the engine even livelier,” says Amann. The crankshaft and primary transmission were lightened, and the timing gear was upgraded with a set of titanium valves. The cylinder head has been reworked and gas-flowed, and the original Amal carburetors have been swapped out for a bank of three period Dell’Orto PHFs, to suit the ported cylinder head. Given the extra power, the gearbox has been on the operating table too, reconditioned and modified to accommodate a close-ratio racing cluster. Rafale is light and ergonomic as well as beautiful, and a lot of thought went into the riding position—not to mention the foot controls and cockpit. The only touch of modernism is the Motogadget Chronoclassic rev counter, which blends in remarkably well with the period switches and clip-on handlebars. The upholstery is a work of art in itself—with some of the most intricate hand stitching we’ve ever seen. 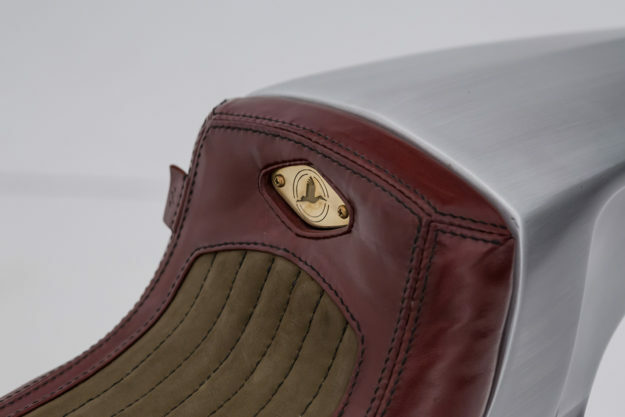 It’s a collaboration between Storik and master leathersmith Jun Takakuda, who opted for a two-tone treatment: Italian plum buffalo and a sage green suede. It adds a subtle touch of color to contrast with the textured aluminum and brass metalwork. If you want a replica of Rafale, you’re out of luck. 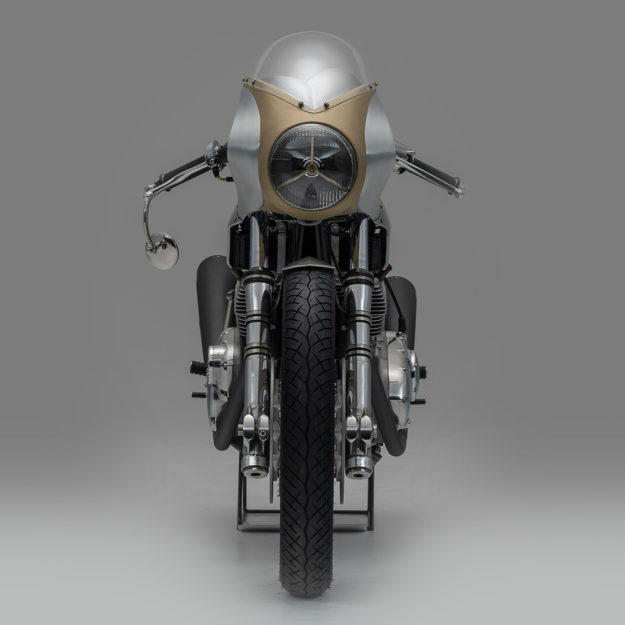 All Storik builds will be one-offs: unique, bespoke motorcycles built to suit individual tastes and needs. 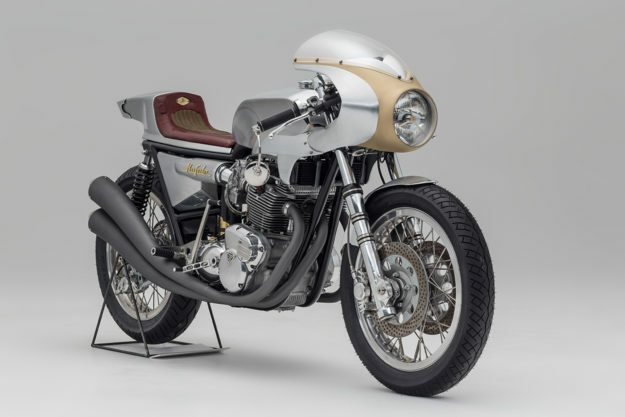 It’s a return to the coachbuilding ethos of yore, for clients who appreciate quality craftsmanship—and have a taste for classic cafe racer dynamics. Custom bike building at this level isn’t cheap—it takes up to a year to develop a machine as well sorted as this. 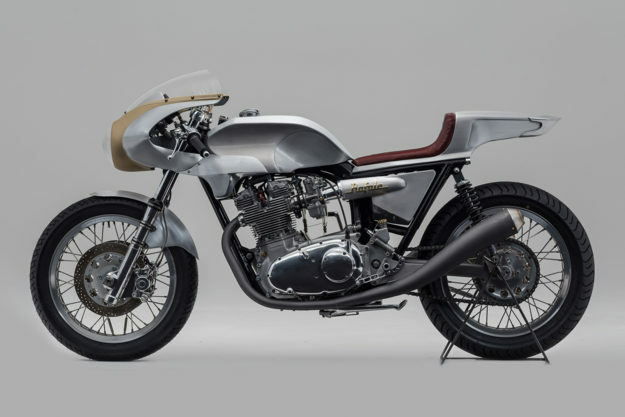 But if you’re in the UK at the beginning of September, you’ll be able to examine the Storik Triumph in close-up at the Revolution Show in Hastings. It’s probably best to leave your checkbook at home.